The nest we built years ago (2009) can be seen below. The original one was trashed by snowmobiles about 4 years ago, so built a new one with a slightly new design. We have had chicks every year since 2010 - not all have survived the other adult loons - jet skis - eagles - fast boats, etc. but most lived to say goodbye to their parents and finally fly off themselves when the ice started to form. It has been fun to be a small part ot their lives. We think our Mother Loon is the same but that she got a new mate about 3 years ago after a really dramatic end of May. We had one hatch 2 days ago and they are still taking turns on the nest on the remaining egg. Like last year - we may only have one surviving chick. I took the egg to the DNR but never heard back about cause of death. Same thing as when I took a chick that died in Jim's lap, from what appeared to be a stab wound (entrails exposed). Really thought they would give us the courtesy of a phone call but that was not to be!! We also buillt a new nest last year to stop the fighting - it did that but the other pair have chosen not to use it. We have a new eagles nest in their area so that may well be the reason. Loons have a happy home near Bonnie Point: all aboard! This raft has been the nursury for two chicks, just hatched. 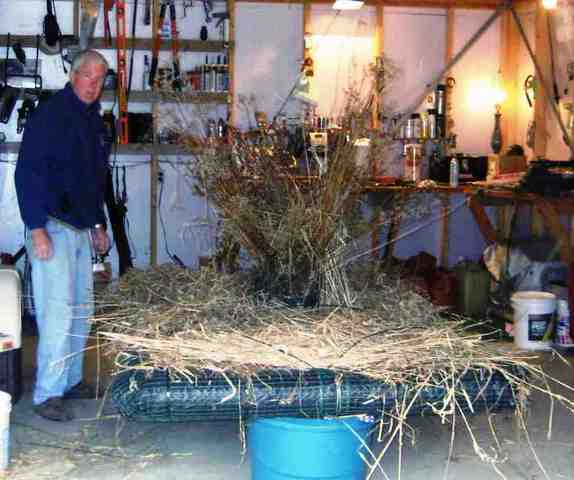 This spring Trish and Jim Bogenrief constructed a repacement Loon Nest Raft for one that had fallen into disrepair. Loons often have a difficult time nurturing thier young into adulthood to join the flock here on Deer Lake. One of the biggest problems in finding a nest that is protected from other animals, water turbulence and human curiosity. Below is their story and some pictures. The platform was built to replace the one in Comfort Cove that had been built by Jim Kasper several years ago as the wood was water logged and the platform had been moved close to shore by the wind. No eggs survived for the past two years due to cold water and animals/birds stealing eggs. After doing research I decided that the PVC pipe would have more longevity than the cedar beams. All of the website designs used 4" pipe, but we knew of a nest build last year that rode too low in the water so I opted to use 6" pipe. I also decided to have a 6" pipe center support to further improve floatation. I knew that the 6" PVC pipe was available in Grand Rapids but they had no T's for the center support and I was not sure about the corner pieces so I bought those in Texas and hauled them home. The middle of April I constructed the 5" x 8" platform. Mike Newton had some 2" x 4" galvanized steel wire, from another project that he provided. This was covered with a layer of dark green snow fencing, a layer of landscaping material and another layer of snow fencing. 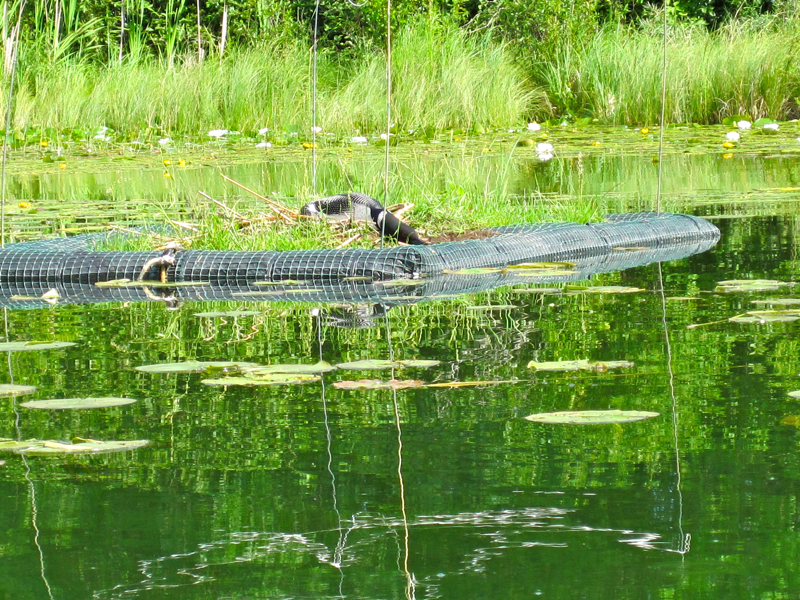 All of this was secured to the raft using plastic ties and the white pipe was now black with dark green over it to look more natural and not attract predators. In the center I made a rounded 1 foot diameter and 1 foot tall receptacle where I stuffed cut weeds and twigs. This will provide shelter for the nest and will help to prevent eagles and herons from being able to get to the eggs (they apparently will not land where their wings will get entangled). 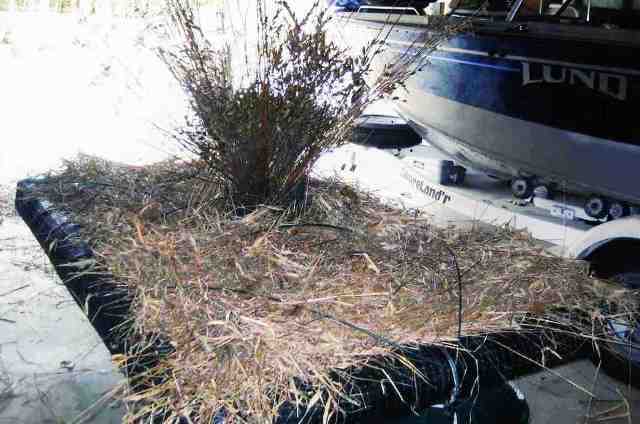 I then covered the entire raft with cut straw like natural weeds from a roadside and around the lake. 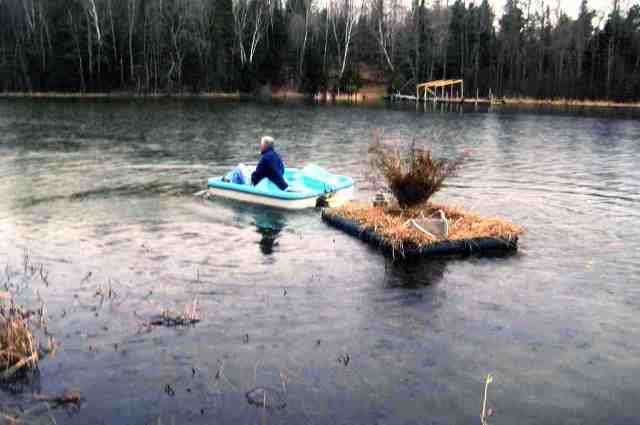 I used bamboo dowel stakes, crisscrossed in the snow fencing, to prevent the weeds from blowing off the raft but allowing the loons to pull them out to form their nest. The last step was to attach 2 stainless steel cables to the platform and cement blocks. The ice did not go out on Deer Lake until April 30th but the loons arrived in Comfort Cove on the 26th. On the 27th we transported the platform to Comfort Cove and Lawrence Weire allowed us to use his dock and paddle boat to launch and secure the platform in a protected area of the cove. We are now anxiously waiting to see if the loons actually use the platform. It is mid-May but for some reason none of the loons on the lake have laid eggs yet. It has been very cold and windy this year, maybe instinct is telling them to wait until the weather improves! Knowing full well that they may still prefer the old platform, we will just have to see. If they choose not to use it then I will try to improve it to be more to their liking for next year. We do ask that people stay well away from these nesting locations until the end of June when the babies are born and old enough to get out of the way. Many baby loons who actually make it through egg predators, wind and water dangers, and finally large fish who like to eat loon babies, only to be caught in a boat prop. As we know all of you love loons as much as we do, and think of them as a major addition to the beauty of our lake, so that you will be on the lookout for these neighbors and their babies while you are on the water.